Looking to build a knowledge base or Wiki website? You’re in the right place. These types of web pages grew in popularity in the last few years. Businesses and organizations are more interested than ever in keeping followers informed about their companies or industries. You can build a site to answer common FAQs, learn more about a certain subjected, or make inquiries. And we have the best knowledge base & wiki WordPress themes to help you get started. Read on. 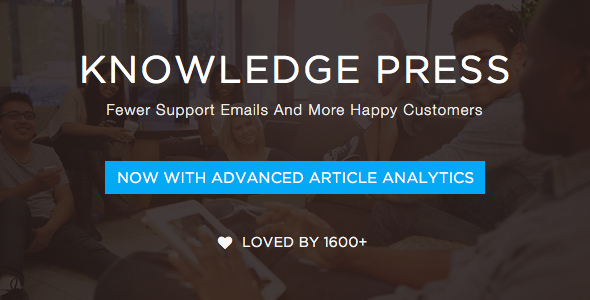 A neat solution for those keen to provide 24/7 support, KnowledgePress helps you build your customer self-service knowledge base in minutes. You can create resource of helpful articles and answer popular customer questions with ease. The theme has an awesome drag & drop knowledge base article and category reorder tool to keep your content organized and includes a premium FAQ Plugin you will surely appreciate. Moreover, its powerful search function and voting system really make Knowledge Press stand out from the crowd. 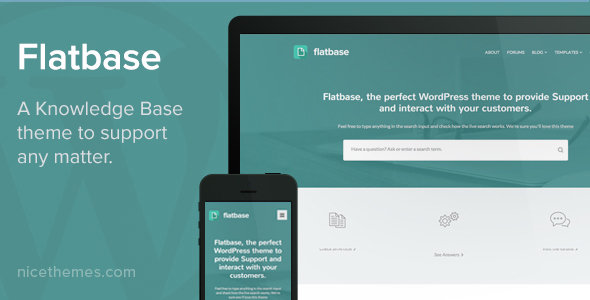 Flatbase is a nicely crafted all-in-one solution to create your own support platform. Its clean and detail-oriented design is the perfect frame to provide support articles, informing and teaching users how to master your product. The theme combines a knowledge base, FAQs, Forums (bbPress integration), and several other handy features that enable you to keep visitors happy. It also comes with a powerful search function and a live customizer that makes tweaking your website a breeze. 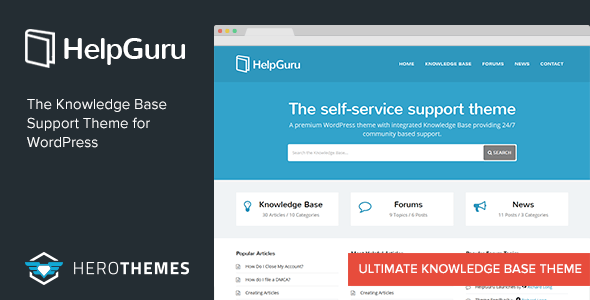 We couldn’t have picked a more suitable first entry for our list of the best knowledge base & wiki WordPress themes on the market. Knowledge Base is a clean and feature rich solution to provide support and basic product knowledge to your customers. It’s responsive, search engine optimized, and easy to use. The theme also allows you to create support forums using the bbPress Plugin and has an impressive AJAX based live search. Visitors can search articles, pages, forums, topics, replies and FAQs. 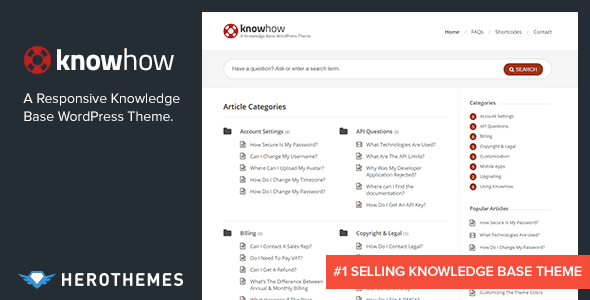 According to its developers, KnowHow helps you set up a knowledge base in WordPress in less time than it takes to brew a coffee. That’s true. The theme is very user-friendly and easy to manage, featuring powerful AJAX live search and a polished design. The theme also comes with great SEO built-in, awesome support, and a neat FAQ page. 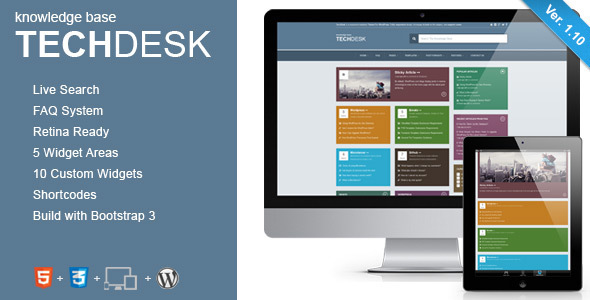 Rounding up our list of the best knowledge base & wiki WordPress themes, TechDesk offers a simple way to create your own base of information, with no technical knowledge or expertise required. It comes with a live search function, minimalistic design, and integrated social media for easy sharing. Furthermore, the theme is easy to customize so it will match your brand and preferences. 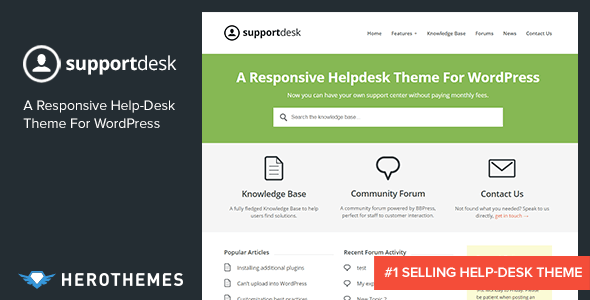 Add outstanding support into the mix and you’ve got yourself a winning WordPress theme. Created to help you spend less time on support, HelGuru comes packed with a plethora of useful features complemented by a clean, functional, and responsive design. If you’re looking to increase customer loyalty and reduce support time, as well as enable customers to help themselves, this might just be the perfect theme for you. HelpGuru comes with lightning fast AJAX search, powerful content ordering options, article attachment, and great support. You basically can’t do better. iKnowledge boasts a fresh and clean design, with a strong focus on content. It has unlimited colors, custom widgets, and page templates. The theme comes with an easy to use WarriorPanel, a custom-made theme options page that’s a thing of beauty. There are also several shortcodes available to help you create some basic elements. Modern and slick, Helper comes with an intuitive user interface, a powerful page builder (Visual Composer), and several custom post types to handle all posts and sections. There are hundreds of customization options available, as well as 9 custom widgets to help you set up your page with ease. You can also embed live chat code easily, which might be an appealing features for your customers – both current and potential. Besides a gorgeous and clean design, Altera also rocks tons of features and options: live search, widgetized areas, FAQ post format, bbPress integration, shortcodes, and so on. The theme is powered by the Redux Options Panel, which is very easy to customize, so you need zero assistance setting up and managing your website. 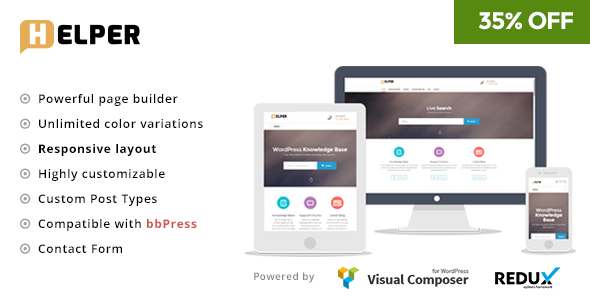 Its easy-to-use page builder also keeps things simple for those without advanced coding knowledge. In short, Altera offers a complete solution for managers looking for the best knowledge base & wiki WordPress themes available. Support Desk is perfect for providing a comprehensive support resource for your customers, not to mention the fact that it’s easy to set up and manage. Fully compatible with bbPress, the theme allows you to build an online community and maintain meaningful relationship with your customers. A FAQ page is included, as well as a powerful search function and multi-language support. All in all, it’s obvious we’re talking about one of the best knowledge base & wiki WordPress themes available. 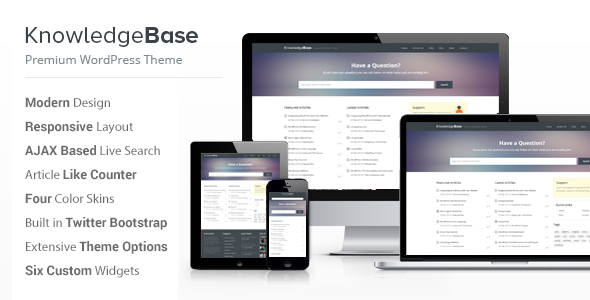 Why Pick One of the Best Knowledge Base & Wiki WordPress Themes on Our List? A strong theme will allow you to keep your information neat and organized, so visitors can access it with ease. The entries on our list are custom-build to do just that. Moreover, they come with amazing features that will make your job as administrator a breeze. These include powerful search options, advanced customization options, and intuitive interfaces. Last but not least, these themes are user-friendly, so they enable you to set up your site in minutes without any help or coding knowledge, which is always a plus. In other words, pick one of the best knowledge base & wiki WordPress themes on our list and you’re good to go. Since knowledge base websites are growing in popularity, developers are focused on building stunning themes to support them. We’ve gathered the crème de la crème to give you a head start and help you stand out from the competition. Choose any of the best knowledge base & wiki WordPress themes above and your visitors will keep coming back for more. You’ll have all the tools you need to build a strong online community and spread information in a stylish and memorable manner. As always, for more tips and tricks keep an eye on our blog or subscribe to our newsletter.